A groundbreaking study has for the first time allowed scientists to witness the direct role that an increase in carbon dioxide (CO2) has on the planet’s greenhouse effect. Scientists at the Lawrence Berkeley National Laboratory (Berkeley Lab) of the U.S. Department of Energy led the researchers in their work, as they first analyzed the heightening capacity of CO2 in our atmosphere to take in any thermal radiation given off by the planet’s surface. For the study they looked at the impact on two different locations on the North American continent over an eleven year period. While the influence atmospheric CO2 has over the Earth’s energy balance, that is the balance of energy transmitted to Earth from the Sun against the heat expelled from the Earth is well understood and agreed upon by the overwhelming majority of the scientific community, this was the first time anyone has demonstrated such an effect beyond the confines of a laboratory. Their results were published in Wednesday’s online issue of Nature. The paper agrees with climatologist models of how man-made levels of CO2 will accelerate the greenhouse effect. The sites included in the study were based in Oklahoma as well as the Alaskan North Slope, throughout the years 2000 to 2010. In both locations, CO2 was the culprit for sharp spikes in a phenomenon known as positive radiative forcing – an event in which the atmosphere changes to the degree that it throws the energy balance of the planet off scale. It occurs when the Earth absorbs more solar radiation than what it releases back into space – something that can be measured either from the planet’s surface or high in the atmosphere. For their study, researchers focused on surface temperatures. The overall consequence of this trend was an increase in atmospheric CO2 by 22 parts-per-million (PPM), much of which was the product of burning fossil fuels. At the moment, CO2 levels hover around 400 PPM, slightly above what are considered generally safe levels, and which will mean an increase in annual temperatures by about 33.5 degrees Fahrenheit. The International Panel on Climate Change (IPCC) and other organizations have aimed for a goal of keeping the levels from reaching 450 PPM, something that could likely happen by the year 2034 if worldwide measures are not taken at once to reduce CO2 levels. “We see, for the first time in the field, the amplification of the greenhouse effect because there’s more CO2 in the atmosphere to absorb what the Earth emits in response to incoming solar radiation,” said Daniel Feldman, a scientist in Berkeley Lab’s Earth Sciences Division and the paper’s lead author. 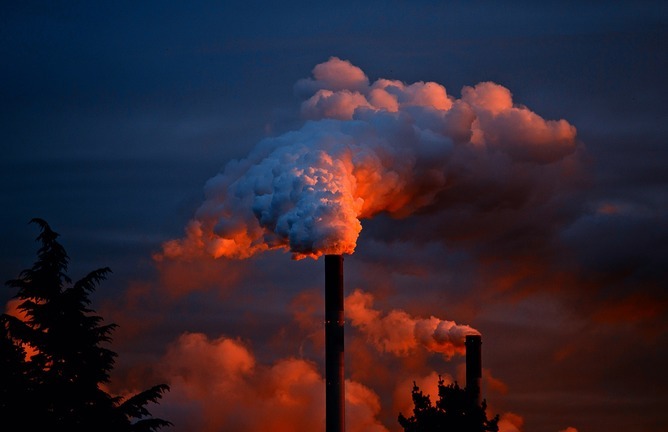 In order to observe the increase in CO2 levels over time, the researchers used some of the most precise spectroscopic instruments, operated by facilities of the Atmospheric Radiation Measurement (ARM) Climate Research Facility at the Department of Energy. These instruments based at both sites, read the thermal infrared energy permeating through the atmosphere onto the Earth’s surface, which they then break down into spectral patterns – the signature of the CO2 particles. These on-location instruments can also pick up and differentiate between which phenomena that are capable of giving off infrared energy, such as any passing clouds or water vapor with chemical components. Using a combination of data from this equipment, the team noticed a gradual rise in the CO2 levels, happening in real time. “We measured radiation in the form of infrared energy. Then we controlled for other factors that would impact our measurements, such as a weather system moving through the area,” said Feldman. Over 3,300 measurements were taken from the Alaska location and 8,300 measurements from Oklahoma, which were taken on a semi-daily basis. The collected data from both sites revealed an identical trend: CO2 levels in the atmosphere emit increasing amounts of infrared energy, an approximation of 0.2 Watts per square meter per decade. While that’s a bit of a hard number to swallow – imagine then that the surface area Earth is about 196.9 million square miles. A data analysis provided by the National Oceanic and Atmospheric Administration’s CarbonTracker system, the scientists linked this upswing in CO2-attributed radiative forcing to fossil fuel emissions and fires, which have become a growing concern in the Western states. Another significant find among these measurements was the influence that photosynthesis – the conversion of solar radiation into food by plants – has on the balance of energy on Earth’s surface, which has never been measured in depth. The spring months showed slight dips in radiative forcing due to the growth of plants.